Tim and I are down in Brazil, surrounded by my loving family and having a blast. Here we celebrate Christmas Eve, so the whole family (grandparents, uncles, aunts, cousins) came over last night to eat, drink and be merry. I spent all day in the kitchen, making my Roasted Turkey with Herb Butter, my Green Beans with Garlic Almonds, my Baked Brie en Croute and then my Classic Cheesecake with Raspberry Sauce and my Baci Chocolate Tart for dessert. My mom and my grandmother also made their signature dishes. My grandma even brought her Brazilian Walnut Torte, a family Christmas tradition! So yummy! It’s tradition to come back the next day – on Christmas Day – to eat the leftovers, so we are expecting them any minute now. And even though we cooked for an army, there aren’t as many leftovers as we’d expected. So what do we do? We make more food, of course! 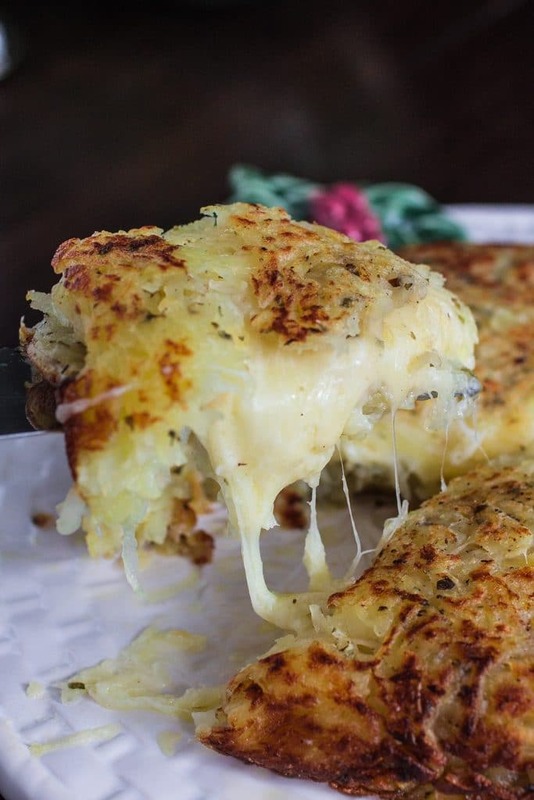 My contribution today is these delicious Three-Cheese Stuffed Rosti Potatoes. Knowing my family, I’m certain they’ll be a hit! I’ve made these potatoes a few times already and it’s become a family favorite. How could it not? It involves potatoes and 3 types of cheese! Some of my favorite things in this world. Rösti, in Swiss German, means “crisp and golden”. 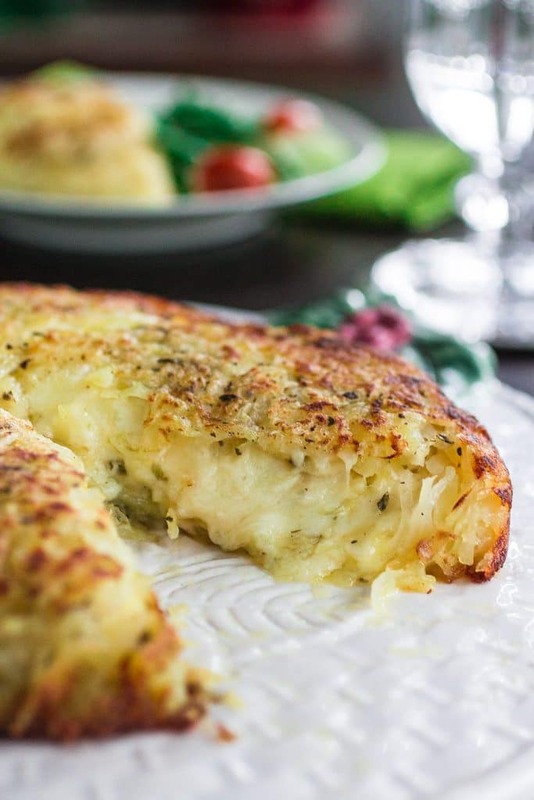 The potatoes are shredded and then formed into some sort of pancake, stuffed with mozzarella, provolone and requeijão (but you can use cream cheese) and then finished with another layer of potatoes. Both sides are fried until crispy and golden, like the name says, while the inside remains soft, buttery, creamy and gooey. Seriously, I’m drooling just by typing these words! ? This dish was originally served for breakfast, but nowadays it is often served as a side. It also works great as a main course, especially if you’re a potato lover like me! Now I realize I should have posted this earlier, in case you guys wanted to give these potatoes a try for Christmas. But don’t worry! This dish is sophisticated enough to be served for you New Year’s Eve party or for New Year’s Day brunch. If you’re eating them for brunch, you can top with sour cream, bacon, chives, caramelized onions, sausage and/or, of course, a fried egg! ? I really love how versatile potatoes are! 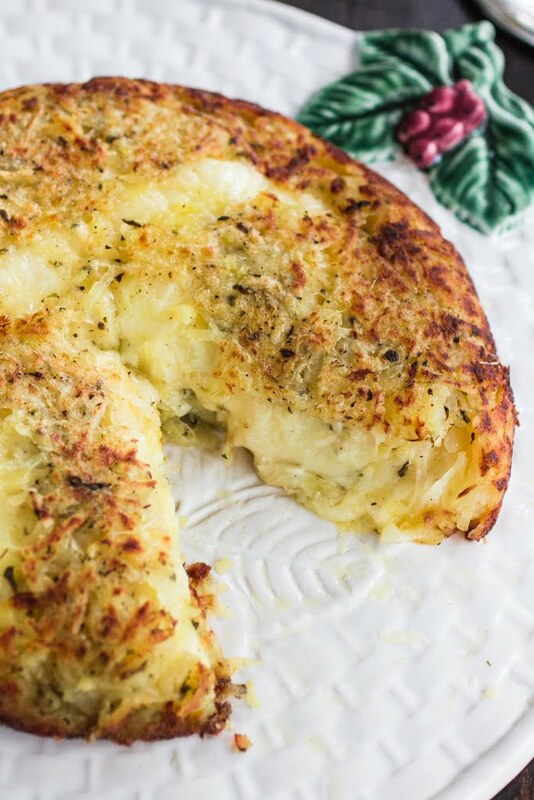 You really can’t go wrong with a potato dish, especially during the holiday season. The day before, cook the potatoes, with skin, in a pot of salted boiling water for 10 minutes or until tender (but not falling apart). Let the potatoes cool and chill them overnight. The next day, peel and coarsely grate the potatoes. Season with salt, pepper and the fresh thyme. In a different bowl, combine the cheese and stir well. Reserve. Heat 1 tablespoon of butter and 2 tablespoons of olive oil in a medium sized sauté pan, over medium heat. Add half of the grated potato, spreading it out evenly to cover the bottom of the pan. Allow to cook for about 4 minutes, or until the sides start to turn golden, while shaping it into a flat cake, pressing down lightly. Pour all the cheese filling into the potato pancake, leaving a small edge all around. Then, spread out the remaining potato on top of the cheese, pressing it down and around as you go, covering all the cheese. Continue to cook for 5 more minutes. 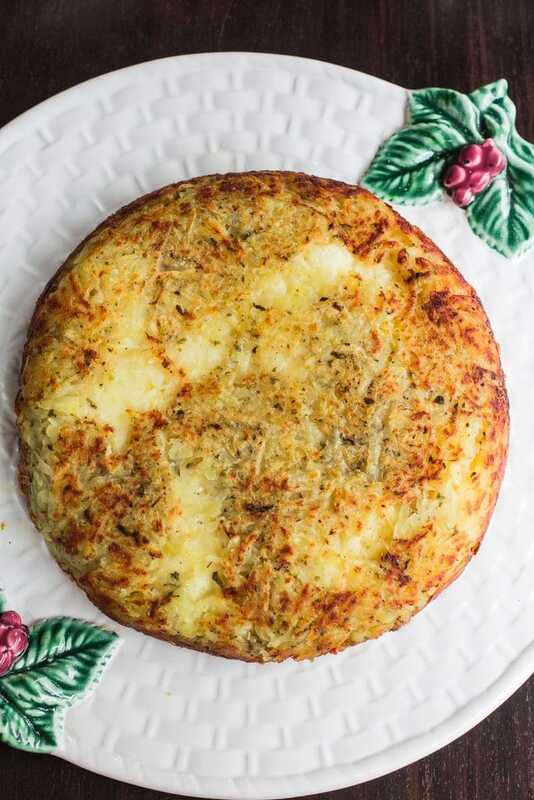 When the edges of the bottom potato cake are golden, gently shake the pan to loosen the Rösti. Then, flip it with the aid of a plate that is larger than the sauté pan. Add 1 tablespoon of butter and some olive oil and, when hot, slide the Rösti back into the pan, uncooked side down. Let it cook for 5 to 7 more minutes or until the bottom is golden brown, adding more olive oil if necessary. Remove to a plate covered with paper towel to soak the excess grease. Let it stand for 5 minutes before serving! Make sure you use a good nonstick and enough olive oil so your rosti potatoes don't stick to the bottom. 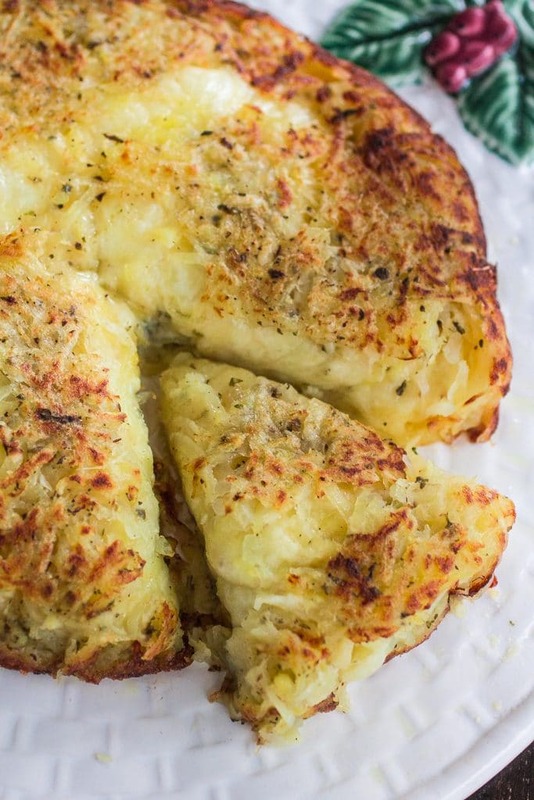 Looking for more delicious potato recipes? Connect with the US Potato Board on Facebook, Pinterest and Instagram for some more inspiration. Hi, fiend. I am very happy to hear you are in Brazil. Nothing like being with our families for Chritsmas. Golden and crispy cheesy potatoes sound awesome! I’m glad you are in Brazil and enjoying your family for the holidays! Happy Holidays, Olivia! Wow this recipe looks amazing.With three cheeses who can say No to this? I bet your family was SUPER happy to dig in. Yum! Can’t you use tat-tots, cook them and put in the fridge overnight and grate them before you put them in the pan?